Super Swampers gathered seeds on Sunday, October 17, 2009. It was a sunny afternoon, so the seed heads were dry. This year we used large paper bags. Usually we grabbed a handful of stalks and bent it gently into the bag. Then we shook it or scrubbed it with our fingers, so the seeds fell into the bag. Seeds of butterfly milkweed were ready to blow away on the breeze. It took some doing to mush them into a bag. 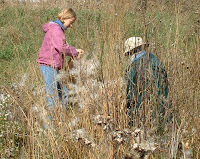 We also collected stiff goldenrod, ironweed, and other seeds. We have plenty to share. If you know anyone working with children or teens to create butterfly gardens or prairie projects, have them contact us.